Flags fly at half staff at the Capitol, in Sacramento, California, to honor the victims of a mass shooting in San Bernardino, Dec. 2, 2015. It's a distinction no country wants to publicize - the sobering statistics which suggest a mass shooting occurred every day this year, such as in the United States. Some criminologists label mass shootings as incidents in which four or more people are killed or wounded. 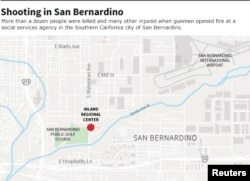 The reality of the growing gun violence was highlighted Wednesday in San Bernardino, California, with the worst mass shooting this year. Fourteen people were killed and 21 others wounded at a social services center. Authorities said two heavily armed shooters were involved in the assault. Both suspects were shot and killed by police hours after the initial attack. "We have a pattern now of mass shootings in this country that has no parallel anywhere else in the world," President Barack Obama said during an interview Wednesday. Last week, the president described the recurring gun violence as "not normal." His comments followed a mass shooting at a Planned Parenthood facility in Colorado Springs the day after the traditional Thanksgiving holiday. The shooting on November 27 took three lives, including that of a police officer. James Knight, a former FBI agent in New York, said suspects involved in mass shootings often take action on their own and lack social skills. The FBI doesn't officially define mass shooting, but Knight notes an FBI study indicates just two of 160 active shooter incidents involved more than one gunman. According to news reports and information compiled by Web sites, such a shootingtracker.com and gunviolencearchives.org, more than 450 people died and more than 1,300 were wounded in mass shootings this year. 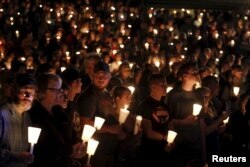 People take part in candlelight vigil following a mass shooting at Umpqua Community College in Roseburg, Oregon, Oct. 1, 2015. Data from news reports and tracking firms also suggest mass gun violence in the United States was widespread in 2015. Some figures have led experts to debate whether mass shootings are deadlier or increased during the past decade. Some Americans feel the incidents are more frequent. "It's almost like there's no more safe haven, and maybe a decade ago people were worried about terrorism when you got on an airplane; now you worry about terrorism or mass shootings whether you're going to school or going to the mall to shop or even going to church," said Mike Arms from Tennessee. 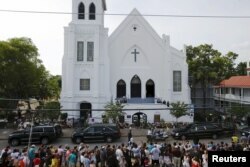 Members of the public line along the street as a hearse carrying the Reverend Clementa Pinckney arrives at the Emanuel African Methodist Episcopal Church for a public viewing in Charleston, South Carolina, June 25, 2015. The information compiled by groups that track mass shootings in the United States this year does suggest mass gun violence has become more geographically widespread, occurring in 220 U.S. cities in 47 states. The numbers have reignited the contentious debate over gun control. Angry over the ongoing violence, Obama urged action "to do something about the easy accessibility of weapons of war on our streets to people who have no business wielding them. Enough is enough.” His administration has criticized lawmakers who oppose stricter gun laws, including a bill that would bar suspected terrorists on the no-fly list from buying guns. In the nation's capital, other people expressed the need for tougher measures to counter mass gun violence. "I do have an opinion and that is as a country, we've decided that lax gun ownership and not good mental health care is the way that we're going to keep doing things," said Washington resident David Heyman. "And so I've grown somewhat numb to these shootings, because they happen every day." Others said the number of mass shootings is unnerving. "I was horrified," said Dru Wood-Bechwith from Boston. "I can't believe we keep turning on the TV and seeing these shootings that happen over and over, and that we don't take some action against guns and gun violence." "We have to be brave," he added, "and do something about it and stand up to the people who think that it's taking away their rights. No one is proud of the fact there there are more mass shootings in the United States than any other industrialized nation in the world."